The Heritage Foundation: Leadership for America – Building an America where freedom, opportunity, prosperity, and civil society flourish. Where do food stamps come from? They come from taxpayers—certainly not from family farms. Yet the “farm” bill, a recurring subsidy-fest in Congress, is actually 80 percent food stamps and other government nutrition programs. The food stamp portion creates a reason for urban representatives to support farm subsidies, and for farm-state lawmakers to support food stamps. It has become the norm that Congress lumps billions—even trillions—of dollars in taxpayer-funded programs together into huge bills. This allows them to sneak in plenty of special-interest pork. Each of these programs deserves to be evaluated on its own, and taxpayers deserve transparency from Congress about how it plans to spend our money. For example, food stamps are a massive program that needs a careful look. Food stamp spending has doubled under the Obama Administration, and participation is at historic highs. Recruiters hold bingo games and other “parties” to try to get more people on the food stamp rolls. Farm commodity programs are also a major concern and in dire need of reform. Congress may eliminate the egregious direct payment program, which pays farmers for doing nothing. However, instead of stopping there, both the House and Senate farm bills would replace direct payments with programs that could wind up being even costlier. Food stamps and farming ultimately have to do with food, but that’s about all they have in common. Making the farm bill 80 percent food stamps just doesn’t make sense. 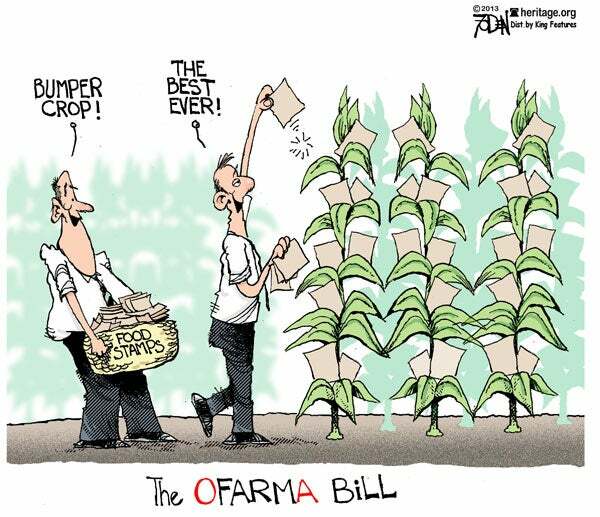 Who Really Gets Farm Bill Money? Whenever Congress throws too much into one bill, special interests profit. The massive farm bill—which is already 80 percent food stamps—is no exception. So what about the rest of the bill—the farm-related part? Heritage’s Diane Katz reports that it includes subsidies for more than a few surprising recipients. SHARE our infographic to spread the word.